As I started my final two weeks of my first full year eating in Northwestern’s dining halls, I was craving real, nutritious food that actually tastes good; even more than desserts. That is saying quite a lot for me. This recipe is one of my favorites even though it is a tiny bit more complicated than the French toast and lemon-Earl Grey bar recipes of the past two weeks. That said, it’s still quite easy to make and results in a particularly scrumptious meal. This week, I took over the kitchen in Allison Hall to make this beloved family recipe: ham and cheese scones. Lightly spoon flour into dry measuring cups and level with a knife. Combine flour, baking powder, sugar, salt and pepper in a large bowl and then cut in butter with a pastry blender or two knives until mixture resembles coarse meal. 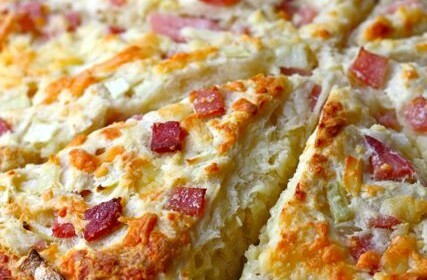 Stir in cheese and ham. Combine buttermilk and egg whites, stirring with a whisk. Add to flour mixture, stirring just until moist. It is important that the dough be the right consistency. It should be only slightly sticky, add flour to attain desired dryness. Turn dough out onto a lightly floured surface and knead (squish and fold) lightly four to five times with floured hands. Pat dough into an 8-inch circle on a baking sheet coated with cooking spray. Cut dough into eight wedges, cutting into but not through dough. Bake at 400 degrees for 20 minutes or until lightly browned.